Posted November 25, 2015 by Jackie McMillan & filed under Chinese, Eat & Drink, Wine, Yum Cha. Granted you could view this new Westfield Bondi Junction opening simply as an excuse not to schlep into the city from the Eastern Suburbs for your regular Cantonese fix, however if you scratch beneath the surface, there’s more than meets the eye. Alongside the usual suspects from the Guangzhou region in the southern part of China, you’ll find wider Chinese influences, and dishes specific to particular places. Typhoon Lamb ($34.80) – or more accurately ‘escape from typhoon’ lamb – for instance, comes from Hong Kong, a place often besieged by typhoons. The dry spiced cooking method is applied to Australia’s favourite protein – lamb cutlets – cutting the fat with lively ginger, garlic and chilli. 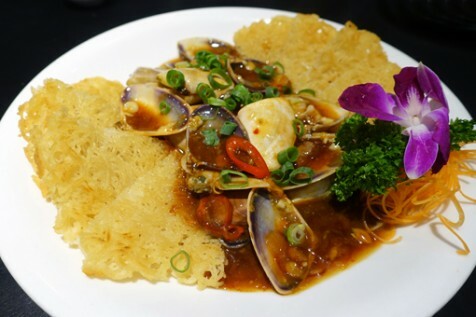 Live seafood is another specialty, with Wok Fried Live Pipis in XO Sauce ($78/kg) impressing for both plump, briny bivalves and an XO sauce that’s far from insipid. Throw in a bed of crisp pan-fried Vermicelli ($15) noodle cakes to unlock its full potential. The 2014 Yabby Lake ‘Single Vineyard’ Chardonnay ($73) will see you through a well-battered and cooked Garlic Snow Crab ($138/kg), with enough acidity to extend to Braised Pork Belly ($29.80) in dark soy. Branch out from ubiquitous Chinese spinach dishes with the Seasonal Vegetables in Chef’s Master Stock with Dried Scallop and Goji Berry ($24.80) – I bet you’ll like it too!